~ Journey & Destiny of Souls ~ Past Life Regression to Life In-Between Lives! What is your Soul Specializing in? From the end of 1998 to 2004 I had a huge growth spurt and during that time there were a few books that just jumped off the shelves at me. The very first book was Seth Speaks. I was fascinated with how he divided the types of souls into three categories: Healer, Teacher/Guide and Creator. He explained that most souls tend to specialize in one of the three but, of course, many do combine two or three of the 'vocations' as they see fit. It just depends on the abilities, inclinations, talents and desires of the soul. Then, another set of books caught my attention. They were Michael Newton's two books: Journey of Souls and then his second one, Destiny of Souls. I was delighted to find that his research regressing his patients back to where their soul was living in the spirit world in-between lives corroborated what Seth said! Newton outlines many soul specialities, especially in his second book, Destiny of Souls, and I thought it would be apt to use Seth's categories (yes I've got a lot of Virgo planets in my makeup!) as a structure for Newton's soul specialities. Honestly, if you haven't read these books yet, you really must! They give you such a great perspective on why you chose to be You, born into the family you're born into, with all the character traits, challenges, talents and gifts you have! And that brings us to another couple of points.....Is this real? Or what if you feel you don't have a connection to your Guide? What then? So exercise your right to be a full-fledged Co-Creator and use your imagination! "To finally understand what being co-creator of your life really is produces a feeling of wonder. You find you are not out there alone, doing it all by yourself, nor is the Universe out there doing it all without you. There is a harmony in the coming together of your own 'separate', delightful, expansive destiny, mingling and alive within the Divine power that is constantly urging you toward greater understanding of who you are. What makes your life so enjoyable is your sense of participation in a co-creative wonder in which you have choices. Co-Creation is vision-making and you are all vision-makers. If you can imagine it, you can create it." Well, that was a bit of a tangent....oops, I feel another one coming on...! So, yeah, that's another thing....pay attention to what works for you. Just because the popular thing may be to do this or that is no reason to think that it will work for you, too. Always listen to your own intuition. Just quickly check in to see if whatever decision you have to make feels good and if it doesn't, just drop it. If there is a more important decision at hand or you're at the end of your rope feeling lost just ask for guidance from your guide. And that brings us back to the original question - how to connect with your guide? Well....this is where your imagination comes in handy again. Some people can really see their guides, in their minds eye or during meditation, and feel like they are really tangible beings. I've had some verrrrry interesting dreams where I've met guide's and helpful beings but the Guide, with a capital G, that I address isn't very tangible to me....but that doesn't stop me from addressing him/her/it and getting answers! Basically, I just say, "Hey, Guide! I know you're there!" Then I'll give him/her/it a big energetic hug of love and gratitude just to get things off to a good start. Sometimes I go through my 'higher self', it just depends. Make it up! Your guide would love to give you some guidance and support! At the bottom of memory." The healing involved is always psychic and spiritual, and these healers are available to help each personality in your system as you know it, in your present time, and in other systems. In a larger context, and with greater training, advanced healers deal with the spiritual maladies of vast numbers of personalities. There are those who combine the qualities of teacher, creator, and healer. Others choose lines of development that are particularly suited to their own characteristics. A teacher must be able to instruct various portions of one entity (soul), in your terms, at the same time. Say, for example, a particular entity has reincarnations in the fourteenth century, in 3 BC, in the year AD 260 and in the time of Atlantis. A teacher would simultaneously be in contact with thse various personalities, communicating with them in terms that they understand. Such communication demands complete knowledge of the root assumptions of such eras, and of the general philosphical and scientific climate of thought at that time. The entity might well be exploring several probable systems, too, and these personalities would also have to be reached and contacted. The amount of knowledge and training necessary makes such a teaching-communicator career extremely demanding, but it is one of the courses available. The process of learning such information necessarily adds to the development and abilities of the teacher. A delicate manipulation of energy is required, and a constant travel through dimensions. Once such a choice is made, training immediately begins, always under the leadership of a practical expert. The vocation, for it is a vocation, leads such a teacher even into other realms of reality than those he previously knew existed. Others, may begin the long journey leading toward the vocation of a Creator. On a much different plane, this can be compared to geniuses in creative fields within your own physical reality. Instead of paints, pigments, words, musical notes, the creators begin to experiment with dimensions of actuality, imparting knowledge in as many forms as possible - and I do not mean physical forms. What you would call time is manipulated as an artist would manipulate pigment. What you would call space is gathered together in different ways. Such a work would be perceived in your system as one thing, for example, but would also be perceived in probable realities, though perhaps in an entirely different way - a multi-dimensional art, you see, so free and elemental that it would appear simultaneously in many realities. Such an art is impossible to describe in words. The concept has no verbal equivalent. These creators, however, are also involved in inspiring those in all levels of reality available to them. For example, inspiration in your system is often the work of such creators. I remember another dream during this fecund-dream-period where The Voice with it's booming power said, as though talking to other Guides about me, "This entity is Gently Ruly..." I woke up and looked up Ruly right away, of course. I knew what unruly was but I found out that ruly is used very rarely these days, it's quite out of date and that it means orderly or well-behaved. Ha! Kinda funny. "We do repair jobs on Earth - we are the clean up crew - transforming bodies to good health. There are people on Earth who have gray spots of energy which cause them to get stuck. You see it when they make the same mistakes over and over in life. My job is to incarnate, find them and try and remove these blocks so they make better decisions and gain confidence and self-value. We transform them to be more productive people." "Transformers are sent to other worlds between lives to study - those of us who like working with physical forms." S: I work with geometric shapes, such as spirals of energy, forming them in my mind to match the configuration of the particular trouble spot. Then I lay these energy structures around the gray areas. This sets up the areas to be repaired with my slow healing vibrations, like placing a hot pad on a sore muscle. You see, these souls were damaged on the way in and this...infirmity...only grows worse as the body develops on Earth. Dr. N: (surprised) Back up a minute. What do you mean, "damaged on the way in"? I thought your work on Earth mostly involved contaminated energy from life's trials? S: That's only part of the problem. When souls enter the human body o Earth they come into dense matter. Their host bodies, after all, contain primitive animal energy which is thick. The soul has a natural sort of pure, refined energy which does not easily blend with some human hosts. It takes experience to get used to all this. The younger souls especially can be damaged. They get knocked off their tracks early on and are....twisted. Dr. N: Adn you might project different energy configurations with different people who are your patients. S: Uh-huh, that is the job of the transformer. Their damaged energy lines are so...squiggly...they must be rearranged to remove the toxic energy. These muddled souls are so unbalanced that a lot of our work must be directed at all the cells of the body where negative energy is trapping the free flow of the positive. When this is performed properly the soul is more fully engaged with the human brain. PS: on Earth in her current incarnation, S, practiced Reiki. The secret to healing is removing my conscious self so as to avoid inhibiting the free flow of energy between us. My objective is to merge with the energy flow of the patient to bring out the highest good in that body. This is done with love as well as technique. "We work to reshape...to reorganize...displaced energy in the place of the holding ground." S: Before meeting the new arrival one of the Restoration Masters outlines the meridians of energy we will be regenerating. We review what is known about the damaged soul. Dr. N: This sounds like you are surgeons preparing for a procedure with x-rays before the operation. S: (with delight) Yes, this gives me an idea of what to expectr in three-dimensional imagery. I love the challenges involved with energy repair. Dr. N: Okay, take me through the process. S: From my perspective there are three steps. We begin by examining all particles of damaged energy. Then these dark areas of blockage are removed and what is left - the voids - are rewoven with an infusion of new purified light energy. It is overlaid and melded into the repaired energy for strengthening. Dr. N: Before you actuallly begin to work, what do you see when a soul's energy has been severely damaged? S: Damaged energy looks like a cooked egg where the white light has solidified and hardened. We must soften this and fill in the black voids. S: (interrupts) I should have added that the damaged energy can also create...lesions. These fissures are voids themselves, caused by radical physical or emotional damage. Where the energy is mottled - not distributed evenly - this is due to long-term energy deterioration. Dr. N: You talked about rearranging and repairing old energy with new purified energy for healing. How is this done? S: By intense charge beams. It is delicate work because you must keep your own vibrational tuning...in matched sequences with that generated by the soul. "Oh, it's Numi - I'm so glad. I haven't seen her in about three or four lives, but her deprogramming and restorattion energy techniques are just superlative. There are five others being attended to in this place whom I don't know. Numi comes over and clasps me to her. She gets inside me and blends my tired energy with her own. I feel the infusion of her stimulating vibrations and she performs a tiny bit of re-shaping. It is as if I am receiving a gentle reaffirmation of that which created by own energy. Soon, I am ready to leave and Numi gives me a beautiful smile goodbye till next time." The Slumber Chambers are sanctuaries of quiet reflection where a soul might go if they want to rest and regenerate their energy in solitude. S: The Keepers of Neutrality are skilled at noninterference. Their talent lies in ministering to us with absolutely no intervention into our thoughts. They are the custodians of the slumber chambers. They possess great skill in ministering to us. Their concern is the proper regulation and infusion of the energy which we have stored in the spirit world before going into a physical life. Dr. N: I have heard a great deal about this attribute of the soul to divide itself. Why can't you just go to your own spiritual area and take the rest of your energy and meld with it? Or why not have a team of Restoration Masters regenerate your contaminated energy? S: (takes a deep breath) I'll try and explain it. For us, all that is unecessary. It is the effects of the impurities which we want healed by a slow, even return of our own purified, rested energy. The Keepers assist us in the restoring of our own energy. Dr. N: Rather like getting a blood transfusion from your own blood bank? S: Yes, exactly, now you are beginning to comprehend. We don't want it in a rush. We don't need major restoration either. We receive slow energy infusions of our own energy over a prolonged period for greater....elasticity. We want the strength we had before a rough life - and more - from having gone through the physical experience. "The Keepers use their own vibrational frequencies to...massage our energy - which is fantastic." S: In my last life I was an Algonquian Indian with the name Singing Tree. My job was to insure our land would continue to supply us with food. I used to stand out in the forest for hours and hols out my hands. The tribe thought I was talking to the trees and the soil but actually I was exchanging energy with the land. It's an extension of mind and body with some help from our guides. Dr. N: And how about today? S: When you create and support beauty and growth from the land, you also give power to others who live here. From your hands you provide a means by which others are motivated with the beauty of what they see around them, as well as receiving sustenance from the environment. "Knowledge of vortex locations are very useful to planetary healers and caretakers of the environment." "My guide and I assisted a boy in India who was drowning and consumed by fear. His parents pulled him from the river and were trying to resuscitate him, but he was not responding well. I placed my hands on his head to quiet his fear, sent a spike of energy into his heart to bring warmth into his body and superimposed his essence with mine for a moment to help him cough up the water and start breathing again. We were able to help a total of twenty-four people on that trip to Earth." They watch for souls who are ready to stop being obsessed about something on earth (what people refer to as ghosts) and move forward. Dr. N: Please explain to me how all this comes to an end. Dr. N: Oh, you have asked for a release from this sad situation. S: (long pause) Well...not actually...sort of.....but he knows I am about ready. He comes and says to me, "Don't you think this is enough?" Dr. N: Who says this to you, and what happens? S: The Redeemer of Lost Souls calls to me and I move further away from Earth with him and we talk while waiting. Dr. N: Just a minute - is this your spirit guide? S: (smiles for the first time) No, we are waiting for my guide. This spirit is Doni. He rescues souls like me. That's his job. Dr. N:What does Doni look like and what does he say to you? S. (laughs) He looks like a little gnome, with a wrinkled face and a top hat which is all beat up - his whiskers shake when he talks to me. He tells me if I want to stay longer I can but wouldn't it be more fun to go home and see Stanley there. He is very comical and makes me laugh but he is so gentle and wise. He takes me by the hand and we move to a beautiful place to talk more. He tells me to be joyful and he infuses my energy with love and happiness and purifies my mind. He lets me play like a child again among the flowers and tells me to chase the butterflies while he rests in the sun.Doni's old face is so full of kindness and love, he never scolds. He just encourages me to play. His job is to bring my soul back to health by helping me cleanse my mind. Wish to give people the means to help themselves where they can, but they are not the conscience of human beings and they do not interfere with our free will. S: I am learning to adjust my energy beam to diffuse and rearrange the forces of negative human energy generated each day on Earth. It is like opening a dam to provide needed water to make the valley below fertile. I go to a huge dome to practice with my small group. Arlett is there, she is our instructor - very accomplished - catches our mistakes at once. It is here we practice the art of balancing vibrational disharmony. Eventually, we hope to smooth our large masses of disruptive energy patterns on Earth. Dr. N: What happens in the dome? S: It provides a geometric base for certain oscillationsi and intervals to simulate erratic waves of human thought from large groups. It is deliberately stirred up for us. We are supposed to smooth it out. Dr. N: Mmm...to foster expressions of harmonic thought? S: Yes, thought and communication. We also study vocal tones and analyze their meanings - anything which influences negative thought. We want to help people who wish to help themselves. This is not direct interference. Dr. N: All right, Larian, but when you become proficient at being a Harmonizer Soul, what power will you possess? S: We will become senders of recovering energy to combat mass disillusionment.The melody of a Harmonizer whispers through the corridors of Earth of better things to come. We are messengers of hope. Highly advanced souls that are still incarnating on Earth even though it is unnecessasry for their own personal development. They are skilled linguists with the ability to phrase words in vibrational tones that deeply touch people. These wise beings are here because it is their mission to help humanity in a direct physical way. They are unobtrusive and may wish for no public attention. These super-advanced beings do not incarnate but receive information from many sources about conditions on Earth and other worlds as well. Watchers provide information to other Harmonizers, who will act to moderate the affects of social and physical forces creating havoc on Earth. "The Dreamweaver souls I have come in contact with all engage in dream implanting, with two prominent differences. 1. Dream Alteration. Here a skillful discarnate enters the mind of a sleeper and partially alters an existing dream already in progress. This technique I would call one of interlineation, where spirits place themselves as actors between the lines of an unfolding play so the dreamer is not aware of script tampering with the sequences. 2. Dream Origination. In these cases the soul must create and fully implant a new dream from scratch and weave the tapestry of these images into a meaningful presentation to suit their purpose. Creating or altering scenes in the mind of a dreamer is intended to convey a message. I see this as an act of service and love. S: I begin with more conventional thought communication while she is awake but I am getting nowhere. She is so sad. My mother's grief at not being at my bedside is overpowering her. Dr. N: What methods have you tried so far? S: I project my thoughts with an orange-yellow light, like the flame of a candle, and place my light around her head, sending loving thoughts. I'm not effective. She doesn't realize I am with her. I am going for a dream. Dr. N: All right, Sylvia, take me through this slowly. Please start by telling me if you pick out one of your mother's dreams or if you can create one of your own. S: I don't create dreams well yet. It is much easier for me to take one of hers so I can enter the dream to effect a more natural contactr and then participate. I want her to know it is clearly me in the dream. Dr. N: Fine, now take me through this process with you. S: The first couple of dreams are unsuitable. One is a muddle of absurdity. Another is a past life fragment, but without me in it. Finally, she has a dream where she is walking along in the fields around my house. You should know she has no grief in this dream. I am not dead yet. Dr. N: What good is this dream, Sylvia, if you are not in it? S: (laughing at me) Listen, aren't you seeing - I'm going to smoothly place myself in the dream. Dr. N: You can alter the sequence of the dream to include yourself? S: Sure, I enter the dream from the other end of the field by matching my energy patterns to my mother's thoughts. I project an image of myself as I was the last time she saw me. I come slowly across the field to let her get used to my presence. I wave and smile and then come to her. We hug each other and now I send waves of rejuvenating energy into her sleeping body. Dr. N: And what will this do for your mother? S: This picture is raised to a higher level of consciousness for my mother. I want to insure the dream will stay with her after she wakes up. Dr. N: How can you be sure she won't think this is all a projection of her desire for you and discount the dream as not being real? S: The influence of a vivid dream like this is very great. When my mother wakes up, her mind has a vivid impression of this landscape with me and suspects I am with her. In time the memory is so real she is sure of it. Dr. N: Sylvia, does the image of the dream move from the unconscious to a conscious reality because of your energy transfer? S: Yes, it is a filtering process where I continue to send waves of energy into her over the next few days until she begins to accept my passing. I want her to believe I am still part of her and always will be. Dr. N: Please explain to me why you require such a long period of solitude after your life in Morocco? S: I am a protector soul and my energy has still not recovered from the effects of this life. Dr. N: What is a protector soul? S: We try to protect those people whose innate goodness and intense desire to better the lives of large numbers of people on Earth must be preserved. Dr. N: Who did you protecct in Morroco? S: The leader of the resistance movement against French colonization. He was more effective in helping our people fight for freedom because of my years of sacrifice. Dr. N: This sounds demanding. Do you usually work with political and social movements in your lives? S: Yes, and in war. We are warriors for good causes. Dr. N: What attributes do protector souls have as a group? S: We are noted for our enduring perseverance and calmness under fire while assisting others who are worthy. Dr. N: If you challenge those who would seek to harm the people you want to protect, who decides if they are worthy? It seems to me this is a very subjective thing. S: True, and this is why we spend time analyzing in advance where we can best be utilized to help people. Our work can be offensive or defensive in nature but we do not engage in any aggressive action lacking principle. "We help the new souls emerge at the place of 'hatching'. We facilitate early maturation...by being warm, gentle and caring. We welcome them. Through us, not from us, comes a life force of all-knowing love and knowledge. What we pass on with our vibrations during the drying of new energy is...the essence of a beginning - a hopefullness of future accomplishment. The mothers call it..."the love hug." This involves instilling thoughts of what they are and what they can become. When we enfold a new soul in a love hug it infuses this being with our understanding and compassion." "Each soul is unique in its totality of characteristics created by a perfection that I cannot begin to describe. What I can tell you is that no two souls are alike - none - ever!" Dr. N: Please explain the surroundings of the place to me. S: It's...gaslike...a honeycomb of cells with swirling currents of energy above. There is intense light. Dr. N: When you say 'honeycomb', I wonder if you mean that the nursery has a beehive structure, or what? S: Um, yes...although the nursery itself is a vast emporium without seeming to be limited by outside dimensions. The new souls have their own incubator cells where they stay until their growth is sufficient to be moved away from the emporium. Dr. N: As an Incubator Mother, when do you first see the new souls? S: We are in the delivery suite, which is a part of the nursery, at one end of the emporium. The newly arrived ones are conveyed as small masses of white energy encased in a gold sac. They move slowly in a majestic, orchestrated line of progression toward us. S: At our end of the emporium under an archway the entire wall is filled with a molten mass of high intensity energy and...vitality. It feels as if it's energized by an amazing love force rather than a discernible heat source. Ths mass pulsates and undulates in a beautiful flowing motion. Its colour is like that on the inside of your eyelids if you were to look through closed eyes at the sun on a bright day. Dr. N: And from out of this mass you see souls emerge? "Our guides decide on the most effective means for self-discovery in the library. The design and scope of these investigations then comes under the jurisdiction of the Archivists." "These records give the illusion of books with pages, but they are sheets of energy which vibrate and form live picture-patterns of events." My next two cases represent the exposure of souls to spiritual libraries and the impact seeing their records has on them. In both cases there is evidence of the use of altered reality, with some differences. The woman in cas 29, a suicide case, will be shown a series of alternate choices she could have made in her past life, presented in four coexisting time sequences. The first timelines was the actual life itself. She will be more of an observer than a participant in these scenes. With case 30, however, we will see the employment of a single scene with an altered reality where the soul will dramatically enter a scene from his past life to actually experience a different outcome. Both cases are designed to show the many paths in life involving choices. 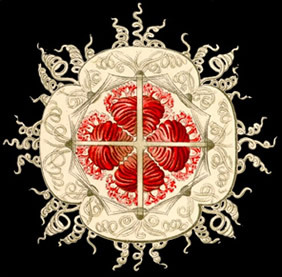 "They appear to represent the last station of beings responsible for souls still incarnating on Earth. These wise beings have great compassion for human weakness and they demonstrate infinite patience with our faults." The time of my expectation has arrived. I am to see the Holy Ones. My guide, Linil, comes and escorts me from my cluster group down a long corridor past other classrooms. We move into another area with a larger hallway that is lined with marble columns. The walls are textured with what looks to be frosted glass panels of many colours. I hear soft choir music and string instruments. The light is a subdued, golden tone. Everything is so relaxing, even sensual, but I am a little apprehensive. We come to an atrium filled with beautiful plants and a bubbling fountain of water. This is the waiting area. After a few moments, Linil takes me into a round room with a high domed ceiling. There are rays of light shining down. 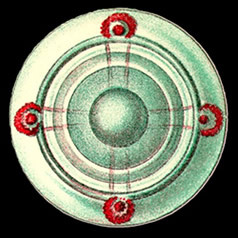 The Holy Ones are seated at a long crescent-shaped table. I move to the center of the room in front of the table while Linil stands behind me to my left. Dr. N. says: "I'll admit that when I initially heard about these hearings there were doubts in my mind. I felt that if a soul was summoned to appear before a body of higher beings, there were going to be certain punitive aspects to a karmic review. This was due to my own cultural conditioning. Finally, I cam to the realization that going before a council has many facets. The Elders are like loving but firm parents, managing directors, encouraging teachers and behavioural counselors all rolled into one. What souls feel for their council is reverence. Actually, souls themselves are their own severest critics. I find evaluations by our soul group companions to be far more acerbic than any council Elder, although our peers do lace their criticism with humour." "When I sat on a panel it was like being inside the soul in front of you. What you feel is much more than empathy toward someone who has just come back from a life. You are really in their shoes. The Presence gives you the power to feel everything the soul feels at the moment. The prism of light from the Presence touches every council member in this way." These are the specialist trainers who will expose those adventursome beings who show talent to trips into different dimensions. Hide-and-seek in the spirit world begins as an exercise between light and darkness. With the younger souls we charge up our energy from a distance and then wink it out when the kids come in our direction. We block and then open up our telepathic energy at the same time to mix up the visual and mental signals. In the beginning we create doorways of light within structured columns of energy which are employed as shadowed panels which may be arranged in parallel or horizontal lines. Later we make them random geometric patterns. Most young ones have a terrible time learning to detect and find us as we dart between the doorways, but they have fun because at this stage they still consider this playing a game. Some become so good we can't trick them anymore. In time these souls - those that want to continue - become trainees and are ready to be ushered into our playground of interdimensional zones, which are divided by energy barriers and vibrational pulse rates. This is tough because the trainees must learn to adapt to different wave configurations which exist within each dimension and match their energy quickly to pass through. We lose many souls at this point who don't wish to continue. The work is like being in a hall of mirrors. The souls like me, who refuse to quit because we love the work, must now master the mental dimensions without structure or form. They exist as vacuums between the physical dimensions. Part of me still considers this training as recreation. It is so captivating I can't wait to get back home and engage in this exercise again with my friends. I remember when I was a very young soul and came to Earth for the first time with a couple of friends. As spirits we floated around to check our capacity and adaptability to this place while accompanied by our teacher. We were shown how to collect the magnetic vibrations of this planet and blend them with our own. We needed to feel what it would take for us to be in physical form here. I have my hands full right now with seven goof-offs. They like being playboys and playgirls during their incarnations. They just want to stay as children and not take life seriously. They are overly fond of earthly pleasures and don't want to deaol with the hard stuff. Their major interest is looking beautiful in the next life. Ulant, my senior guide, has left them with me and I don't see him very much. I'll admit my style is extremely lenient. I use lots of gentleness and love. Some of the other teachers say I spoil them outrageously. I know of teachers who express a lot of frustration and become stern with their young students, especially those with potential. The council is interested in my teaching methods. They want to test my theories of permissiveness rather than giving this class a mental spanking. My concept of teaching is that once these child souls do start to develop, the leap they will take into maturity will be more rapid because they won't have had their self-confidence shaken by too many hard lessons and setbacks too soon. Dr. N: Andarado, we have talked about your work in the spirit world with teaching students. You have also explained a little about your energy creation studies with the thought processes of lower forms of life. This leads me to conclude you are preparing to be a specialist in either teaching or design. S: (laughs) Neither is true. I am training to be an Ethicist. Dr. N: Oh? How about these two areas of your early studies we have just talked about? S: They have been offered to me as prerequisites so I will be more effective as an Ethicist. This is my passion, working wtih the moral codes of intelligent beings. Dr. N: But isn't the reviewing of morality, values and the standards of conduct basic to the work of all teaching guides? S: Yes, but moral principles as they relate to objecctive values are so essential to human development one can specialize in that field. There is usually one Ethicist on every council. S: Being versed in the morality of other intelligent societies is good training for any Ethicist. Travel to physical and mental worlds in our universe and even into other dimensions. Their work ethic is one of reconnaissance. "I was told that to become an Explorer I would have to experience many realities by beginning my travels to physical worlds, and then escalating to the mental existences and interdimensional travel." "From the spirit world to a physical world it is like a door opens and you see the walls, of what appears to be a hallway, a tube, whirling past on either side. Then another portal-type doorway opens and you are there." "When I pass into another dimension to a mental world I am like a piece of static flowing through a TV screen into magnetic zones structurer by pure thought. The voids are composed of large, pulsating fields of energy. I feel the power of this energy more than when I go to a material universe because we must adapt our wave resonance to existing conditions in order to easily pass through. I want to keep my energy tight, so I don't get lost. These trips are not instantaneous, but almost." Michael Newton says: The Explorer Souls do not emphasize a polarity of light and darkness in their travels as much as other elements. These could include a restless or serene environment, thin or heavy density, physical or mental domains, and conditions lending themselves to what has been described as "purified or coarse intelligence." Traveler souls who move into different realms of cosmic consciousness must learn to align their energy with symmetry to local conditions within these demarcations. Explorer guides can take souls on brief visits to higher dimensional levels to raise their consciousness. In the minds of many subjects, these trips don't last long and this is probably to avoid overwhelming younger souls. We are taken by the travelers to the place of the Quigley's. They are the size of a muskrat, fat and fluffy with a forehead similar to a bull-nosed dolphin. The Quigley has big, round ears and straight-out whiskers. They have the IQ of perhaps a smart dog. They are devoted and happy animals who love us. Their planet is an ancient, mystical land of gently rolling hills and valleys carpeted with flowers and small, delicate trees. It is very bright here and there is an inland body of fresh water. We relax and play in this world of perfect peace. Between my lives on Earth, I visit a water world called Anturium, which is so restful after a difficult life on land. Anturium has only one land mass, the size of Iceland. I come with a few of my friends who also have an affinity to water. We are brought by an Explorer-guide who is familiar with this region. Here we join the Kratens, who look a little like whales. They are telepathic and a long-lived race who do not mind our coming and mentally connecting with them for a while. Occasionally, they gather at certain locations to telepathically communicate with intelligent aquatic life forms who exist on two other planets (around stars in the galactic vicinity of Anturium). What I love about this place is the unity and harmony of thought with the Kratens which rejuvenates my mind and reminds me of my original planet. Dr. N: So what does Phinus, your guide, say to you when he meets you in the spirit world after your life in India? S: She says, "Welcome back, how did you like the ride?" Dr. N: And what is your response? S: Did it have to be so terrible? Dr. N: Deos she agree with your assessment of life in India? S: Phinus reminds me that I volunteered to have a difficult opening life on Earth because I wanted to receive the full impact of a disruptive planet. I was the poorest of the poor in India and lived in squalor. Dr. N: Did you want to suffer this much in your initial life? S: The life was terrible and I didn't handle it well. When a childless family took my daughter against my will by paying the owner of the shack where I lived, I became so distraught I could not function. (Kanno jerks in his hcair and emotionally relives the moments after his last death) WHAT KIND OF PLANET IS THIS ANYWAY? PEOPLE SELLING CHILDREN! Dr. N: (at this point I do not yet know about Kanno's hybrid origins and I make a wrong assumption) This does seem as though it was a very difficult first incarnation for a new soul on Earth. S: Who said I was a new soul? Dr. N: I'm sorry, Kanno. I just assumed that right now you are only in your second incarnation on Earth. S: That's true, but I'm from another dimension. Dr. N: (startled) Oh, then what can you tell me about this other dimension? S: We had no physical worlds as you have in this dimension. My incarnations were on a mental world. Dr. N: What did you look like on this world? S: I had an elongated, flowing body - spongy, with no skeletal structure. We were rather transparent forms of silvery light. Dr. N: Did you prefer a certain type of gender? S: We were all hermaphrodites. Dr. N: Kanno, please explain the difference between travelling to the dimension of your origins from the spirit world as opposed to coming into our universe. S: In my dimension movement is like going through soft, translucent filaments of light. Coming into your universe is like plowing through thicki, heavy, moisture-laden fog. Dr. N: And being on Earth for the first time - what was that like compared to your home world? S: Having concrete tied to your feet. The first thing you notice is the heavy weight of the dense energy here compared to a mental world. (pause) It isn't just heavy - it's coarse....severe...I was really jolted in that life in India. Dr. N: Is all this a little better now - are you becoming acclimatized? Dr. N: I can see that. Kanno, what is the most troubling aspect about the human brain for you? S: (abruptly) Ahh - it's the impulsive behaviour - the physical reaction to things - without analytical thought. There is danger in connecting with the wrong kind of human being, too....treachery...I can't deal with this. Dr. N: (Kanno is sweating profusely and I quiet him now a bit before continuing) Tell me about your mental world. Does it have a name? S: (pause) It's a sound which I can't re-create with my voice. (begins reminiscing) We float in a sea of gentle mental currents...soft...playful...so unlike Earth. Dr. N: Then why come here? S: (with a deep sigh) I am studying to be an Explorer-teacher. Most of my associates are satisfied to confine their efforts to one dimension. I finally told Phinus I wanted broader experience with a hard world in a completely different zone of existence. She told me she had a senior colleague who recommended another dimension with a strenuous physical world that had a reputation for producing vigorous, insightful souls (with a gallows laugh) - once you survive the lessons. This was Earth. Dr. N: Did you get the impression there were other choices open to you? S: (shrugs) Guides don't give you many choices in such situations. Phinus said that when I completed my work on Earth I would be strengthened in ways my friends who refused such assignments would not be. She said Earth would also be quite interesting and I accepted that. Dr. N: Did any of your friends come with you into our dimension? S: No, I was the only one who elected to go and I almost refused to return again in this life. My associates think I am very brave. They know if I make it, I'm going to be an effective traveler. Dr. N: Let's talk about travel, Kanno. As an interdimensional traveler, you probablly know if there is a finite number of dimensions around our physical universe. S: (flatly) I do not know. Dr. N: (cautiously) Well, is your home dimension next to ours? S: No, I must pass through three other dimensions to get here. Dr. N: Kanno, it would be helpful if you would try to describe what you see as you pass through these dimensions you are familiar with in your travels. S: The first dimension is a sphere full of colors and violent explosions of light, sound and energy...I think it is still forming. The next is black and empty - we call it the unused sphere. Then there is a beautiful dimension which has both physical and mental worlds composed of gentle emotions, tender elements and keen thought. This dimension is superior to my original dimension and your universe as well. Dr. N: It's now your universe too, Kanno. Tell me, does the trip through the total of four dimensions take long? S: No, quickly - like air particles passing through a filter. Dr. N: Can you give me a sense of the structural design between these dimensions in relation to the spirit world? You described the dimensions as spheres. Why don't we start with that. S: (long pause) I can't tell you much. Everything is...in a circle around the center of the spirit world. Each of these universes appears to me to be an interlocking sphere with the next, as in a chain. Dr. N: (after failing to gain more information) How are you getting on in our universe now, Kanno? S: (rubbing his hand on his forehead) Better. I am learning how to discharge my energy in a steady, positive stream without depleting my reserve. It helps me to be away from people for long periods. I expect to really improve after a few more lives, but I am looking forward to completing my time here on Earth. You could do this if you were advanced enough in the creation of energy. But even if you had this ability, your dog would not be quite as real as a professional could do for you. An Animal Caretaker Soul has the skill to track and find the spark of soul energy which did not die with Socrates and reconstruct your dog exactly as you knew him on Earth. Your pet will know you and be able to play with you whenever you wish and then he will go. S: I have a dog and a cat as well as a horse. These are my pets from the last life. I must call for them as they don't normally live in our spaces here. I can't go to their place. An Animal Caretaker brings them to me. We call them trackers. Dr. N: Do animals have souls? S: Yes, of courose they do, but in many varieties. Dr. N: What is the difference between animal and human souls? S: The souls of all living things have different...properties. Animal souls have smaller particles of energy...less volume and are not as complex and multifaceted as the human soul. The main difference, other than size and capacity, is that animal souls are not ego-driven. They are not overwhelmed by identity issues as we are. They also accept and blend with their environment rather than fighting to control it like human beings. (stops and then adds) We can learn from them. Dr. N: Could you describe what you do? S: (quietly, without boastfulness) I am a Musical Director of souls. A singing conductor - it is my passion - my skill - my pleasure to give to others. Dr. N: Are you better at this than other souls because of your musical talent in your past life as an opera singer? S: Oh, I suppose that one follows the other, but not everyone is as focused on music as I am. Some souls in musical groups may not be paying attention to the entire score. (smiles) Because of the musical range possessed by souls, they need a director to keep all these virtuosos on track. After all, this is recreation for them. They want to have fun as well as produce beautiful music. Dr. N: So, you enjoy working with choirs rather than an orchestra? S: Yes, but we mix it up to make the singing come together. When spirits apply themselves to instruments and voice sounds, it's wonderful. It's not stray notes. The harmonic meshing of musical energy reverberates throughout the spirit world with indescribable sounds. It takes you to new mental levels...moving your energy...communicating in unison with large numbers of other souls. Their range is staggering....vibrations pouring out in many directions...everyone hitting incredibly high and low notes without warning while I am struggling with their cues...and yet it's all pure rapture. I will begin by reviewing the activities of the structural souls who are in training to use energy for the designing of planetary geology. I think of them as architect-builders of topography who work with the component parts making up planetary surface features. This would include mountains, bodies of water, atmosphere and climate. Although structural specialists are associated with souls dedicated to landscaping with plants, trees and living creatures, that work is considered to be a separate classification of design. Structurally oriented souls are likely to begin their craft by constructing, in the spirit world, objects they knew in life. Dr. N: What was the nature of your structural work then? S: Oh, you know, the use of energy in structural composition. I like to sculpt matter into utilitarian designs. Dr.N: Did Hyanth come with you to your new study group? S: No, Hyanth did not take to this concentrated structural work all that much...and so she went to another group that was being formed. Dr. N: What did Hyanth obuject to about your new group? S: (with pride) Hyanth is attracted to designing the beautiful aspects of environmental settings suitable for life. She is wonderful with scenery. While I might construct a fitting series of interconnecting mountains she would be more interested in the plants and trees growing on the mountan. Dr. N: Let me understand something. Do you just go to a physical world and build a mountain, with someone like Hyanth concentrating on life forms such as trees? S: No, we work with physical worlds which are forming and set in motion the geologic forces which will build the mountain. My structural projects don't have to have life. Also, Hyanth doesn't create a forest of adult trees on worlds suitable for life. Her people would design the cells which might eventually grow into the trees they want. My next case is another illustration of those souls who work with living organisms. These designer souls are the biologists and botanists of the spirit world and they say that extraterrestrial life exists on billions of planets. I have an extensive file one souls who have incarnated on other worlds and souls who have travelled to a variety of strange worlds for both study and recreation between their lives on Earth. Dr. N: Kala, I would like to further explore what you have told me about your assignment to Jaspear. I think this would help me understand your speciality. Why don't you begin with your training class and how the project on Jaspear was presented. S: The six of us have been assigned to work with some seniors (Design Masters) to deal with this world where runaway vegetation has threatened the food supply of the small land animals. Dr. N: So, basically the problem on Jaspear involves the ecosystem? S: Yes, the thick vines...a voracious vinelike bush. It grows so fast it kills those plants needed for the food supply. There is little space left for the land creatures of Jaspear to graze. Dr. N: And they can't eat the vines? S: No, and that's why we went to Jaspear on this assignment. Dr. N: (reacting too quickly) Oh, to rid the planet of these vines? S: No, they are indigenous to the planet and its soil. Dr. N: Well, then, what is the assignment? S: To crete an animal which will eat the vines - to control the spreading of this bush which chokes off so much other vegetation. S: (laughing) It is the Rinucula. Dr. N: How are you going to do that with an animal that is not indigenous to Jaspear? S: By creating a mutation from an existing small four-footed animal and accelerating its growth. Dr. N: Kala, you can change the DNA genetic codes of one animnal to create another? S: I could not do this by myself. We have the combined energy of my training class, plus the skillful manipulation of the two seniors who have accompanied us on this field trip. Dr. N: You use your energy to alter the molecular chemistry of an organism in order to circumvent natural selection? S: Yes, to radiate the cells of a gropu of the small animals. We mutate the existing species and make it much larger so it will survive. Since we don't have the time to wait for natural selection, we will also accelerate growth of the four-legged animal. Dr. N: Do you accelerate the growth of the mutation so that the Rinucula appears right away, or do you accelerate the size of teh creature itself? S: Both - we want the Rinucula to be big and we want this evolutionary change to take place in one generation. Dr. N: How many Earth years will this take? S: Oh...fifty years or so...to us it seems like a day. Dr. N: What did you do to the small animal who will become a Rinucula? S. We keep the legs and hairy torso - but it all will be larger. Dr. N: Tell me about the finished product. What does a Rinucula look like? S: (laughing) A...large curving nose down around the mouth...big lips...huge jaws...massive forehead...walks on four legs with hooves. About the size of a horse. Dr. N: You siad you kept the hair of the original animal? S: Yes, it's all over the Rinucula - long reddish-brown hair. Dr. N: What about the brain of this animal - is it greater or less than a horse? S: The Rinucula is smarter than a horse. Dr. N: He sounds like something out of a Dr. Seuss children's book. S: (grins) That's why it's so much fun to think about him. Dr. N: Has the Rinucula made a difference on Jaspear? S: Yes, because he is many times the size of the original animal, and has other alterations - such as his huge jaw and body strength - he really is eating up the vines. The Rinucula is a docile creature with no natural predators and a voracious eater, like the original animal. That's what the senior's wanted. Dr. N: Do you know how this experiment ended? S: Jaspear is now a more balanced world of plant eaters. We wanted the other animals to thrive as well. The vines are now under control. Dr. N: Do you plan eventually to have highly intelligent life on Jaspear - is that what this is all about? S: (vaguely) Perhaps the seniors do....I have no way of knowing. The co-ordinators in the "Ring of Destiny", engaged with past, present and future tinmelines of people and events. They give the impression of actually directing the presentations in our theatre-in-the-round. The place of future life selection is seen as a sphere containing highly concentrated force fields of glowing energy screens. The place of life selection has been characterized as the Ring of Destiny, where we first behold our next body. Most subjects see the Ring as a circular, domed theater with floor-to-ceiling panoramic screens which surround them completely while they are situated in a shadowed viewing area. The Ring displays futuristic scenes of events and people the soul will encounter in the life to come. The whole spiritual structure of the screening room is designed to give the viewer an ability either to observe or participate in the action, just as in the libraries. It does seem to me that more people elect to enter the screens of the Ring during life selection than with the screens in the other learning centers. They want to actually experience snippets of future events in certain bodies before making any final decisions. The preference to enter a scene or just observe is always left up to the individual soul. As with the smaller consoles, the Ring also has what appears to be control panels or lever bars to monitor the action. People call this procedure scanning the timelines, and the more advanced tell me they can control the array of events in front of them with their minds. The sequence of events can, to some extent, be regulated in stop action for parts of a future life the soul may wish to consider more carefully. Dr. N: Obidom, can you tell me what you do between lives that represents your greatest challenge as a soul? S: I study time on the planet Earth. Dr. N: To what end? S: I wish to be a master of this art...traveling the timelines...understanding the sequences with people living in a physical world. To help the planners assist souls in their life selections. S: To work with time, you must learn spatial manipulation. You start with models and then go to the real thing. Dr. N: What sort of models? S: (dreamily) Oh...a huge vaporized pool...of swirling liquid energy...thinning in those gaps where scenes are simulated for us in mini-bites...the gaps open...you see neon tubes of fluctuating light...ready for entry. (stops) It's really hard to explain. Dr. N: That's all right, Obidom. I would like to discuss where you are now working, who teaches you, and something about the practical art of becoming a Timemaster. S: (quietly) Time training is conducted at a temple (grins) We call it the Temple of Time - where teachers instruct us in the application of energy sequences for events. Dr. N: What are the sequences? S: Timelines exist as energy sequences of events which move. Dr. N: Tell me how you manipulate energy in the timelines. S: Time is manipulated by compressing and stretching energy particles withini a unified field and to regulate its flow...like playing with rubber bands. Dr. N: Can you change events in the past, present and future? Is that what you mean by manipulation? S: (long pause) No, I can only monitor the energy sequences. We operate as...highwaymen who enter and exit the sequences - which we consider roads - by speeding up and slowing down. Condensing our energy speeds us up and expansion slows us down. It's the same thing with events and people who appear on the sequences as points on the roads. We don't create anything. We intersect as observers. 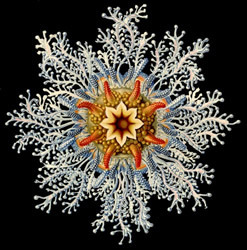 At about the same time that I started to make this webpage, I discovered the Ernst Haeckel biological illustrations (from the 1800's!) that I've included on this page. His gorgeously unique images seemed a perfect match for the content of this page - each lovely image representing each of our souls in all our unique, juicy, wonderful glory!